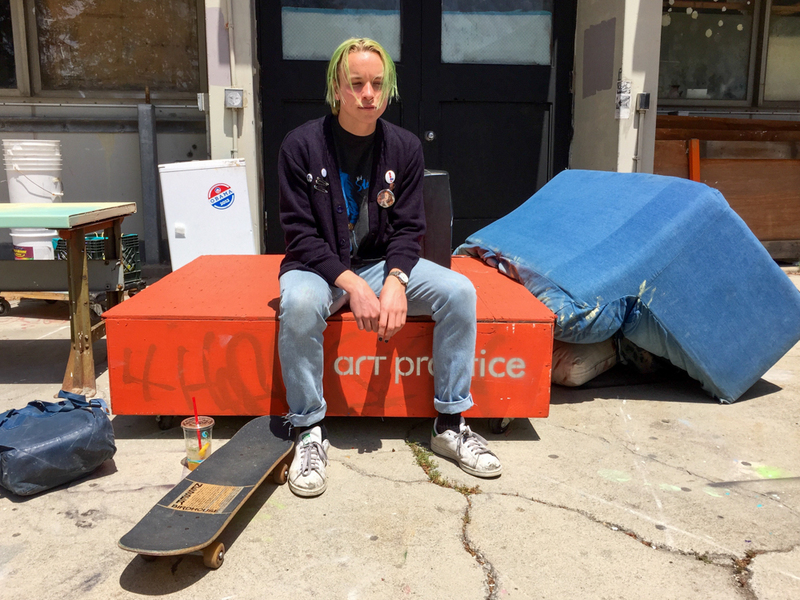 ListenSD had the pleasure of catching up with lead singer Cole Becker of SWMRS before they played Beach Goth 4 in Santa Ana for the second year in a row. Check out his thoughts on Beach Goth, managing college while being in a band and what he’d ask Miley Cyrus if he ever met her. How was playing Beach Goth last year? We were originally on the bill as Emily’s Army, but this was first gig we performed as “Swimmers”. We played five demos that we haven’t done anything with yet. Two of them are going to be on our upcoming album- “Uncool” and “Silver Bullet”. What are you hoping for your set this year? That we’re able to play music together and have a great time. So the people who come to see good music and entertained and have their minds expanded in some way. We keep it restricted to playing heartfelt music and don’t plan anything other than giving 110%. The Aquabats and Subhumans. Honestly all the bands. The Frights, No Parents. Mac Demarco. Why did you drop the vowels – Swimmers to SWMRS? It was hard to Google and find pictures of us. SWMRS just went on tour with Wavves & Twin Peaks – how was that? It was our first support tour with a band within the same context as us. We did Warped Tour as Emily’s Army, which was a lot different. This was more informative. We met Wavves’ manager and they suggested the tour and we took it. We’ve been wanting to do a nationwide tour, but Seb (bassist) & I are in school. Is it hard to be in a band and go to school? Joey (drummer) & Max (guitarist) help set things up. They take care of us. It’s hard to balance, but when you have two band mates connected to the technical side of things, it’s a lot easier to manage. Not sure yet but probably something in Humanities, film studies or women’s studies. Your upcoming album is produced by Zac from FIDLAR – how has it been working together? We met him at Burgerama and sent him some demos. He thought we were trying to be FIDLAR, so we sent him some demos that sounded way different and was down to work with us. It was a long courtship. What distinguished the sound of these demos from FIDLAR’s sound? A lot of the demos I wrote as hiphop instrumentals for the friend who raps. I turned them into weird R&B, bedroom pop siongs. That was a turning point. Another song called “Figuring Out” that has a much bigger rock sound. Where we grew up in Oakland has an interesting music history- a convergence between East Bay punk and hyphy, alternative hip hop sound. Being surrounded by that got us interested in a broad range of music. De La Soul was really influential on this album, the more hip hoppy songs. I learned from Public Enemy how to speak your own truth and talk about things happening in my life. Dinosaur Jr. was also a huge influence. You just released a punk rock tribute to Miley Cyrus – what inspired you to write this song? Is it sarcastic or are you actually a huge fan of Miley? I have a huge, deep respect for Miley Cyrus. Obviously with any pop cultural figure that goes through transformation in her life, she has some questionable actions and I don’t respect everything she does. Like her giant dread locks? What are those? Talk about about cultural appropriation. What would you ask her if you met her? What’s it like hanging out with your dad Billy Rae?